Pleasure B is the largest clown group in Japan. They have been well received not only in Japan but in foreign countries as well. Please come see the exceptional skills of the Japanese clown for yourself. Pleasure- B has been an established clown troupe since 1994. As of 2009 we had 45 active members. We are an unique performance group due to the fact that we are the only clown group in Japan. Our headquarters are in Nagoya, Japan but we bring our laughter and fun to the whole country. Pleasure B performs on the stage in Nagoya, as well as, children's theaters, kindergartens, Theme Parks, special events, shopping centers, and Wedding Halls to name a few. The yearly performance with all active members is regularly sold out due to the popularity of the show. Individual and small group performances have become equally popular . for children who want to learn the art of juggling and pantomime. Pleasure B also has a free workshop to help the clown to be get started. from all over to the world came to participate in the Expo. and the United States every year. At the WGA Convention (World Clown Association) Pleasure B had some outstanding results. A 2nd place and the 3rd place finish in the inaugural competition held in the United States. Moreover, Clown "K" has been an established NPO "Hospital Clown" performing in hospitals since 2006. 1995The first full member performance that has since been an annual event. 1996Started crown training course. Devoted energy promoting clowns in Japan. 2000Mr. Khadgaa of the Mongolian circus is hired as the coach. Co-stars in the Mongolian circus. 2002Performed at the Mongolian international mime festival. 2005Performed at the exposition 'Love and earth Expo' in Aichi 2005. World crown festival' is held at the Expo site. 2006Started visiting hospitals and gained the status of "Hospital Clown". 2009The 3rd "World clown festival" is held. Richard Snowberg and Kenny Ahern are invited as lecturers. 2010The 4th "World clown festival" is held. Queen of the clowns of Russia, Antoshka, and Patch Adams are invited as lecturers. Performed at the Shanghai Expo. In Pleasure B, the group named PLE-MIX is also in to acting. 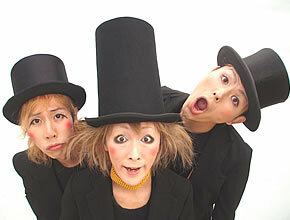 PLE-MIX performs not only in Japan, but they have recently participated in the Britain Edinburgh Fringe Festival.